Galen Erso places a flaw in the Death Star design such that a single torpedo could destroy the station. He sends Bodhi Rook, an Imperial defector, to Saw Gerrara with this information. Saw gives this message to Jyn, which contains the location of the Death Star plans. Captain Cassian Andor rallies troops, and they proceed to steal the plans together. On the ground, the troops create a distraction, and many give their lives to facilitate transmission of the plans to the rebel fleet. Meanwhile, the fleet destroys the planetary shield so the message can get through. Cassian and Jyn find and transmit the plans, not knowing if someone can even receive them. Admiral Raddus downloads the plans in the rebel flagship. When the Empire disables the ship, an unnamed rebel saves the plans to a disc and dies at the hands of Darth Vader as he passes them to another unnamed rebel, allowing the disc to reach Princess Leia. Leia downloads the plans to R2-D2, and when rescued, finally delivers the droid to the Alliance leadership. Finding Galen’s intended flaw, the rebels launch an attack. Luke destroys the Death Star with the help of Han Solo and Chewbacca. So, who is the hero? 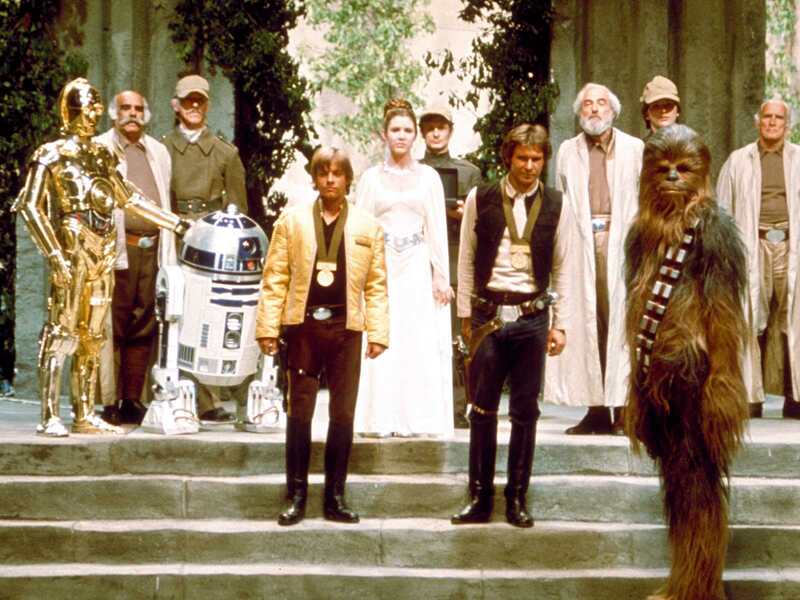 While only two receive medals in the closing shot of Star Wars: A New Hope, each person—each link in the chain—above was just as crucial, just as needed to destroy the Death Star. With the exception of Leia1 and some in the rebel fleet, everyone in steps 1 through 9 died, not knowing if their efforts would succeed. How does one press on, even sacrifice themselves, if they have no idea whether or not their efforts will make a difference? The rebels did so because they have hope, faith, and love. One of clearest messages of Rogue One is hope. Facing insurmountable odds, characters twice say, “Rebellions are built on hope.” This stands in contrast with those who only look at statistics like K-2SO and many Alliance council members. Without hope, people would only do what is likely to succeed. But when we need the improbable to occur, we can only break free from a fatalism of the likely with hope, taking every chance given to us. Literally blind, Chirrut Imwe embodies faith in Rouge One. When he proclaims, “I fear nothing, for all is as the Force wills it”, he essentially places trust in divine providence. Note that he attributes a will to the Force, which is otherwise impersonal in the Star Wars universe. Nevertheless, it most closely resembles Biblical theism when he (and Qui-Gon in Episode I) acknowledge and trust the will of the Force, (for what has a will other than a person?) In this way, we see that faith is not just believing a doctrine, but trusting the will of another. Chirrut also exemplifies how to find strength in his spirituality. He continually reminds himself, “I am one with the Force, the Force is with me.” This is not religious brainwashing, but purposefully holding on to the truth that he has previously learned when present circumstances would cause doubt and fear. Relying on the Force, he literally “walks by faith, not by sight.” (2 Cor 5:7) © Lucasfilm LFL. Cassian: Do you think anyone’s listening? Jyn: I do… Someone’s out there. Lastly, the heroes of Rogue One have love. They sacrifice because they care about other individuals as well as the cause. Galen tells his young daughter that everything he does is to protect her, which includes placing the flaw in the Death Star. In turn, Jyn’s love for her father inspires her to complete his act of defiance. Most others rebel out of their general love for the galaxy, to see it freed from tyranny. Since they do not focus on themselves, they can persevere even if they never see the results. On the other hand, director Orsen Krennic serves as the foil, obsessed with his personal achievement. Caring foremost about his prestige, he could not let go of the Death Star project, but insists that he remain in control. Ironically, he sees the results firsthand and dies by the weapon he created. Not only does Rogue One highlight the rebels’ hope, faith, and love, we see how they catch these contagions from one another. Jyn quotes Cassian about hope. Baze regains his faith seeing Chirrut’s successful bravery. Jyn planned to mind her own business, but her father’s love motivates her to continue his efforts to oppose the Empire. In the same way, the Rebel Alliance can inspire us as we aim to make the world a better place. Allow me to provide a personal example. While my wife and I blog about movies, TV, and literature, we hope to benefit others by highlighting the spirituality of Jesus. Just as most rebels could not see the end result of relaying their message, I usually cannot see how a blog post affects a reader. But I have hope that this website benefits people. I must trust God that the right person stumbles on the right article at the right time. And I need love, as the hardest part is reminding myself that the goal is helping others, not having a popular blog. Enough about me. What mission are you on? Can you persevere, even when you do not see the results? How can you learn from the Rebel Alliance and emulate their examples of hope, faith, and love?